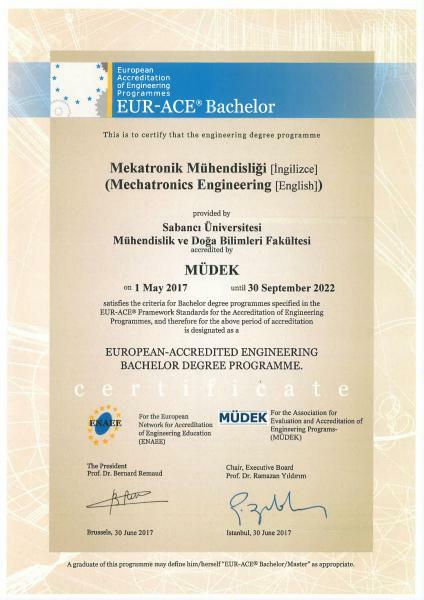 Mechatronics Engineering Program of the Faculty of Engineering and Natural Sciences has been accredited by MÜDEK as of 1 May 2017. MÜDEK (Association for Evaluation and Accreditation of Engineering Programs) is the only authorized association in Turkey for accreditation of engineering undergraduate programs. MÜDEK accreditation acknowledges the suitability of our Program’s to high standards and expresses quality assurance. Our Program is eligible for “EUR-ACE Label” of the European Network for Accreditation of Engineering Education. MÜDEK is also a full member of Washington Accord, multi-party accreditation recognition agreement under the umbrella of International Engineering Alliance. For benefits of accreditation and other details, visit the accreditation web page.